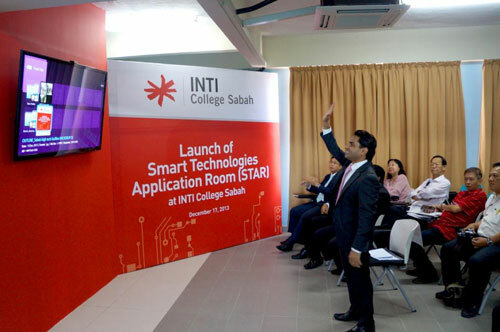 Collaborative learning tools that enable students to connect and interact with their peers, instructors and employers across Malaysia and abroad are among the advanced technology made available to students of INTI College Sabah following the launch of the Smart Technologies Application Room (STAR) on campus. The new high-tech facility with resources such Epson’s Easy Interactive Tools which allows instructors and students to highlight documents and images in various Microsoft formats on a projection screen, thus making presentations and lessons much more compelling, is one of the latest investments made by INTI with the goal of empoweringstudents via international exposure, innovative learning and individual development. Since 2012, RM 1 million has been invested in new and upgraded facilities at INTI College Sabah alone, including for tourism and hospitality training. These include a new reception, servicing and counselling area, mock housekeeping room, upgraded training restaurant and refurbished hostel for student accommodation. The launch of STAR was held in conjunction with a signing ceremony between INTI and three of the state’s leading hotels: Shangri-La’s TanjungAru Resort & Spa, Hyatt Regency Kinabalu and Le Méridien Kota Kinabalu, to provide internship and other learning opportunities for INTI’s students. INTI’s special role as Malaysia Center for Tourism & Hospitality (MyCenTHE) cluster leader in Sabah, and its close ties with leading industry players places it in an ideal position to spearhead human capital development in the hospitality and tourism industry through education.With Laureate’s backing, INTI is ready to contribute to the Malaysian government’s effort to attract 36 million tourists to Malaysia and generate RM168 billionin revenue for the country by year 2020. INTI is eagerly expanding its efforts with the Ministry of Tourism and Culture to ensure the success of the Malaysia Tourism Transformation Plan. INTI’s partnerships with industry players include those with the Malaysian Association of Hotels Training and Education Centre (MAHTEC) for industry certification for hospitality graduates; Dorsett Hospitality International for training facilities and other learning resources at INTI Subang; and Hard Rock Hotel for internship programmes and other learning opportunities at INTI Penang. Along with new facilities, INTI College Sabah is introducing new and dynamic diploma and degreeprogrammes that are career-focused and industry-relevant, thus ensuring abundant career opportunities for our graduates. Diploma in Marketing, 3+0 BA (Hons) in Accounting & Finance and 3+0 BA (Hons) in Event Management & Marketing will be offered in January 2014, with other new programmes in the pipeline.